Who is the the rider in the photo above. Read on to find out more. Finally I think we have sorted the problem of shelters collapsing during Emerald storms. 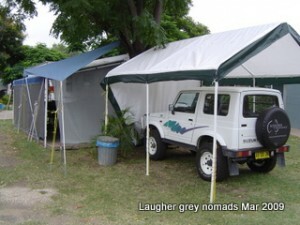 As previously reported on, we had dramas with the main caravan awning just after Christmas. Then we had problems with the shelter I had bought for Suzi. Both units are a faulty design as once water starts to pool a collapse is imminent, as the weight of the pooling water gets heavier and heavier. Designed to fail and yes they do! I picked up this new shelter in Rockhampton and left one bay out of it as its is long enough to cover Suzi and if a put it all up it would be out in the middle of the road. I’ve ordered some shademesh sides but won’t get them till after easter. Outside of work, on a lazy Sunday morning. Work has kept David busy. He has now done all his necessary training to be allowed on site at 5 of the coal mines in a 150km radius from Emerald. He also has just done his working at heights training so he can now do jobs on mining sites above 1.8M off the ground. So far he has worked at Curragh (at Blackwater, 75km east), Kestrel and Oaky (30km and 100km NE of Emerald), Blair Athol (120km north) and at Rolleston (140km south). Jan has been looking for suitable work but with no success as yet. She is still doing volunteer work a Vinnies when she can. 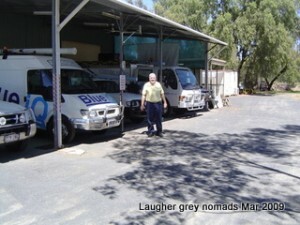 We spent a weekend at Rockhampton about a month ago. A bit of shopping for things you just can’t get in Emerald. We also had a few drinks with Linda & Ivan who we befriended when they occupied the site next to ours over January. We went out for tea last weekend to the “best” Emerald restaurant – The Capricornican – for our 28th anniversary. Where have those 28 years gone. We both reckon we’ve got a few good years left in us yet – watch this space. With a boss who has a motorbike and 3 of his workers also, it was just a matter of time before David revisited his past. Wasn’t meant to happen as quickly as it did, but hey, the right machine at the right price just happened to be sitting in front of the local Honda shop. 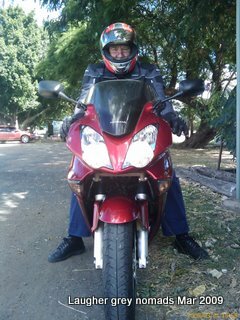 So yesterday a 2006 Honda VFR800 joined our vehicle fleet, with Jan’s full approval. She is itching to go for a trip with David. During our courting days we both enjoyed riding around on David’s Honda XL185. He went for a ride with his boss, Les, yesterday. Up to Capella and back. The Guess Who photo at the start of this post was taken outside the Capella Railway station (north of Emerald). Today a pack of 5 went for a trip to Anakie (west of Emerald) and back. 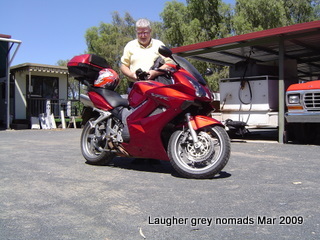 David's new toy - a 2006 Honda VFR800, 64,000km but as new, V4 16 valve motor, 12,000rpm redline. 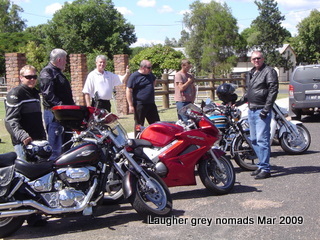 Five big boys and their toys - from left - Brendan, David, Les, Marc, a bystander with no taste (he was admiring the Suzuki, not the Hondas) and Wayne. Jake took the shot. Brendan, David, Marc and Jake all work for Les at Blue iQ. Wayne is Brendan's father. Just for now, David has a broad smile most of the time. He is a bit rusty with his riding but plenty of saddle time will soon fix that.